InTruBeauty: Save Your Money and Just Use Your Own Goshdarned Cutips!!! Save Your Money and Just Use Your Own Goshdarned Cutips!!! perfect for effortlessly erasing mistakes during application without disturbing the rest of your makeup. these easy to use soft cotton tip swabs are individually filled with the best selling almay® oil free eye makeup remover formula. You know when you're browsing in the beauty isle and you spot a product that is a really great idea, but there is this voice inside you saying "it may look like a cool concept, but it isn't going to be worth it!" I know this isn't necessarily a new concept, but its probably the most accessible product for us without ULTAs, Bare Minerals, etc around. Well, that is how I feel about Almay oil-free makeup eraser sticks. I do like Almay products and like their makeup remover towelettes, however, I'm not a fan of these eraser sticks which are basically just cutips for 5x the price. I didn't think they had exceptional makeup removing properties either. I had on Make up For Ever black eyeliner and could still see traces of the liner after using 2 of these "eraser sticks". You only get the benefit of using one end as opposed to being free to dip both ends of your regular cutip in makeup remover which is not a difficult concept or task to master! Also, the liquid that moves down into the other tip is not a large amount. The end of the cutip isn't even that wet. You obviously don't want too much liquid as it will become oily or remove concealer you don't want removed, but I think these should pack a little more bang for their buck. These are $5.99 for a pack of 24. You can usually get hundreds of regular ones for a couple bucks. If you like their formula, I would say just dip your own cutip in the liquid makeup remover. For me, these just aren't worth the price. I could see using it to put in your purse or for traveling to correct any makeup smudges during the day, however a tip of a wet paper towel would likely do the same thing for free. I just don't think I would use these enough to justify repurchasing. The cute little package comes with 24 liquid filled sticks and states it gently removes makeup, no greasy residue. One end of the cutip has a purple line around it and the other end looks like a normal cutip end. You are suppose to gently "snap" the purple lined end allowing the liquid to be released from this end, flowing down the clear stick into the regular looking end. I think these have sold people more on the convenient packaging and marketing than on the product. I mean, do you want to give some company $6 to pre-fill a little stick for you? I mean really think about it. I was surprised when looking for reviews on the Internet that in general people seem to like these. Well, the first one I tried to snap gently, but the entire tip came off. There was a little liquid that tricked down to the other end, but not very much. I had to snap a 2nd one which went a little bit better. But these are a little stiff and so I doubt I'm the only one to ever have completely snapped the top off so much that not much liquid traveled to the other end. It also warns to use carefully around the eye area. Of course, you are going to use ANY product carefully around the eye area, but I would think these would be made for the eye area. I mean where else are you going to be using a cutip to remove makeup? Certainly not your whole face. You would need to use all 24 sticks for that! Normally, I take a regular old cutip, dip the end in makeup remover, usually Clinique Take Off the Day, and use to remove any pesky liner that washing my face or using a cotton pad or cotton ball didn't remove. I would say for this, if it ain't broke, don't fix it. I do however enjoy the Almay Oil Free makeup remover towelettes. $5.99 for 25 towelettes. soft, pre-moistened towelettes instantly lift away all traces of makeup, dirt and oil in one easy step. conditions, hydrates and soothes skin without irritation. botanical blend of aloe, cucumber and green tea nourishes skin as it gently lifts away even waterproof or longwearing makeup. this face makeup remover leaves no greasy residue, so there's no need to rinse. This is my second package of these I have used. The second time around I learned to put these towelettes in a plastic baggy because the flap opening does not want to stick after its been used a couple times and the towels tend to dry out. I use these when I don't necessarily feel like washing my face but want my makeup off. These feel really amazing on your skin and will leave you feeling refreshed. That is the main purpose I see with them. As for their removal properties, they are okay. It definitely takes several swipes on both sides of these towelettes to remove most of your makeup. These are not a one wipe does it all towelette. The second best feature is this product really does seem oil free and it does not make me break out, so they are great for sensitive skin. These are great for summer months to make you feel refreshed without showering. Another benefit is these are not drying. So, if you're looking for something that is a refreshing face wipe and non-oily, I would say consider buying the towelettes, otherwise these are not a must have product if you are looking for heavy duty makeup remover capabilities. I would stick with Clinique Take the Day Off. 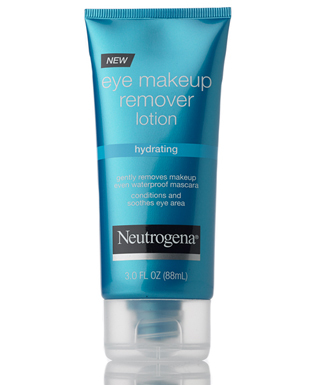 Or I would also recommend Neutrogena Hydrating Eye Makeup Remover Lotion. $6.99, 3 fl oz. This was rated 5 of 5 stars on Neutrogena's website based on 10 reviews. I love the concept of makeup remover in a lotion form. This feels great going on your skin and is fantastic at removing makeup. I am a big fan of Neutrogena products, and this is no exception. Fantastic product. This has been a little hard for me to find at stores, they must either be selling out or just not on all store shelves. So, if you're looking to try something a little new in the makeup remover arena, I would try the Neutrogena lotion and skip the makeup eraser sticks aka really expensive cutips. The unique formula quickly removes makeup--even waterproof mascara--while still being gentle enough to use daily. Plus, a replenishing blend of cucumber and aloe extracts helps smooth the look of dry lines and puffiness. What is your favorite alternative makeup remover? Ie: cloths, lotions, swabs, etc (non liquid). What are your thoughts on the fancy cutips?